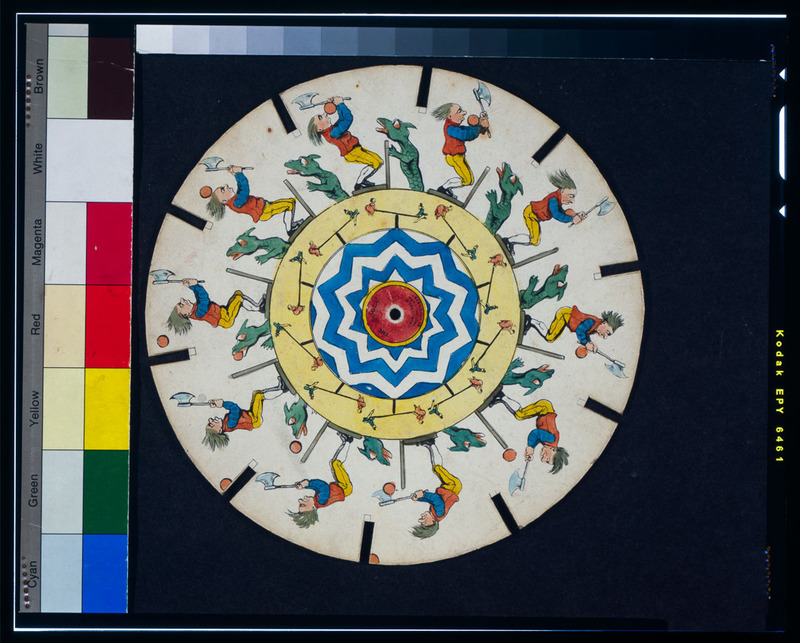 Before movie animation, and even before the zoetrope, the Belgian physicist Joseph Plateau invented the phenakistiscope. You could pin the disc to the eraser of a pencil, and then hold it up to a mirror, and peek through the cutout slits at the reflection. So you’d see a drawing through the slit, then your view gets blocked, then through the next slit you’d see the next image, much like the intermittent motion of a movie projector (image projected, shutter closes, film gets pulled to next frame, shutter opens, etc). Optical illusion disc which is spun displaying the illusion of motion of a couple on a seesaw in a circle at the center of the disc and a man with an ax attempting to chop a lizard in a circle at the outer edge of the disc. Here’s the source file, as downloaded from the L.O.C.